Hi I’m Stephanie. Welcome to Big Dog Mom, a brand dedicated to large and giant breed dogs and the people who love them. If you have a big dog, you are in the right place! Looking for tips on how to provide the best care for your big dog? Grab your FREE Do’s and Don’ts Guide to Big Dog Ownership today! Is not unlike choosing a spouse. Yes, you heard me right. I believe people SHOULD think of it this way; both the puppy buyer and the dog breeder. For now, I am just focused on the puppy buyer side, however, I would argue that breeders should take the time to carefully consider whether the person inquiring about their puppies is someone they want to spend the next 10-15 years with. While I am not advocating testing your future spouse, I am suggesting that health be a factor in your decision. It is no different with our dogs. We have come a long way in recent years in the field of canine health and genetic testing and most reputable dog breeders do some or all of this testing on their breeding stock BEFORE breeding in order to both prevent disease in their puppies but also to track their lines for inheritable diseases. That said, while I know some dog breeders who question the validity of all these tests, I do not know of any breeder that I would consider reputable that doesn’t do at least SOME health tests on their breeding stock. 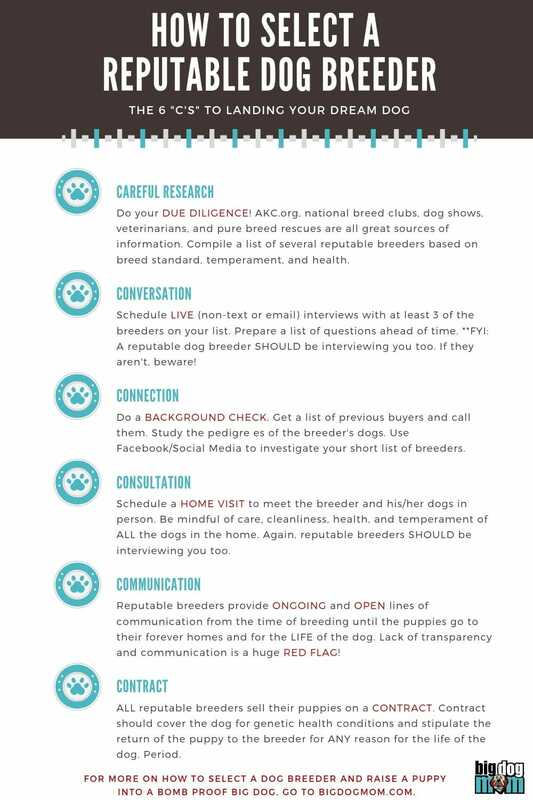 If you are considering a breeder that does not test their dogs, walk away… fast! Do you think you would make it to a second date with this person? When selecting a dog breeder, I believe both the personality of the breeder and the temperament of his/her dogs is a consideration that cannot be minimized! As I mentioned in my first post Do You Own A Big Dog Or Want To? Big Dog Mom Can Help! I have experienced the best and the worst when it comes to temperament. I encourage you to read Linus’s story here, Life With An Aggressive Dog: A Letter To My Sweet Baboo. Is this dog breeder someone I can comfortably speak to? Do I have rapport with this dog breeder? Is this dog breeder willing to answer all of my questions without being defensive? Are they knowledgeable and experienced in the breed? Is this breeder respected by colleagues and experts in the breed? And, perhaps most importantly, is this dog breeder asking YOU more questions than you are asking him/her? If your answer is no to any one of these, walk away! Your prospective spouse seems normal enough, but wouldn’t you stop to consider the bloodlines from which he came? That is going to be the blood running through the veins of your children after all. When you are choosing a dog breeder, I strongly urge you to do your homework on the history of their pedigrees. What you see is a strong indicator of what you will be getting. If you don’t like it, walk away… kindly. What are other people saying about this breeder? Now, I’m not talking about gossip or Facebook silliness, but honest feedback from respected folks in the breed. Does this dog breeder have a positive reputation? Can you speak to former puppy buyers, the breeder’s veterinarian, or maybe to popular handlers whom you trust to get information? “Like” them on Facebook and observe how they speak to people and what information they share. I have found true colors are often seen in social media so go with your gut on this one. Do I really have to compare this to a, prospective spouse’s reputation? If so, walk into any STD clinic. And if you would like help with what questions to ask prospective dog breeders and others to assess their reputation during this due diligence process, read the Top 7 Questions To Ask A Dog Breeder Before Buying A Puppy. And when you are ready, download your free 40 Questions to Ask a Dog Breeder Guide to use during your interviews. Do you think he/she will be around when life is no longer keg parties, but poopy diapers and tantrums? In the same way, is this dog breeder committed to you, the prospective buyer, and to the puppies they produce? Does this dog breeder have a solid contract in place for this puppy that protects both you and the breeder for the life of the dog? As a Big Dog Mom, I do maintain consistent communication with Junior’s and Sulley’s breeders. I have come to understand what an important and valuable relationship these are for me and for my dogs and how much I value the knowledge, expertise and support they give me. If you catch your boyfriend/girlfriend lying to you about anything other than which surprise restaurant they are treating you to, you might want to step back and consider the honesty and integrity of the person you are marrying. Likewise, look for a dog breeder that will share with you the positives and the negatives about their dogs. Does this dog breeder gloss over the negatives or present them as positives? Does he present his dogs as though they are perfect? Does this dog breeder hyper-focus on some areas but not others? In the world of mastiffs, breeders who consistently tout and publicly report their dogs’ size and weight are a huge pet peeve for me. 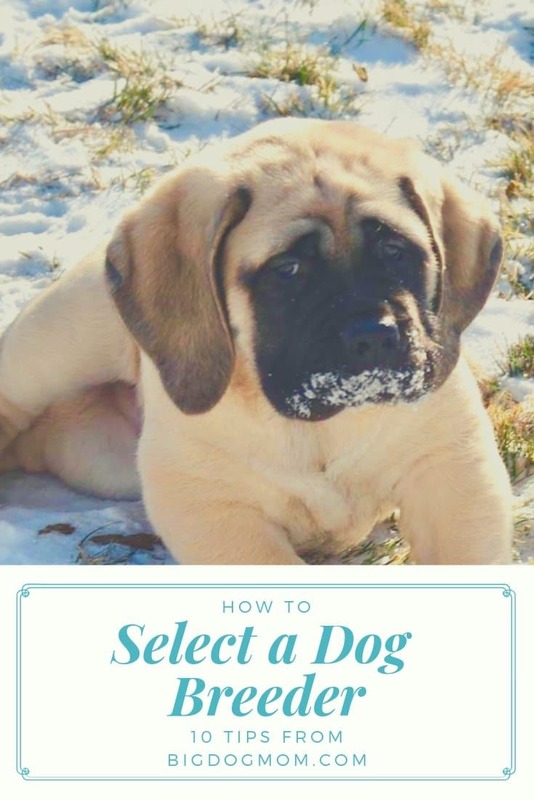 When a Mastiff that fits the breed standard, his size and weight will fall in line where genetics say they should. Therefore a dog breeder who focuses on his dog’s size and weight is doing both his dogs and the Mastiff breed a huge injustice. In your breed, is it excessive wrinkle, angulation, or drive, etc.? Don’t forget to grab your FREE Do’s and Don’ts Guide to Big Dog Ownership. Your dog breeder will be the one person solely responsible for the care and raising of your new puppy for the first 8-10+ weeks of his/her life. Future posts will focus on the critical periods of development that a puppy goes through during these early weeks and what breeders can/should do to make the most of them. For now, consider this. Your future dog breeder is like your prospective new mother-in-law. This woman was responsible for the care and raising of your soon-to-be spouse before you came in the picture. When raised well, you reap the rewards! Consider reading my interview with Jadem Mastiffs for an example of what good looks like in terms of a breeders role in socializing and stimulating puppies. What does your spouse think of this dog breeder? If not a spouse, a trusted friend or family member? Don’t discount the feedback you get. As a mother of two children, I can only PRAY they will heed my warnings and listen to me when they are selecting their future spouse! Alright, time for a gut check. Is there anything still nagging at you or questions you have that have gone unanswered? I have found that, especially when puppies are already on the ground and I have already fallen in love, this gut check is particularly challenging. Like with human relationships, sometimes we have a hard time defining exactly what is in our gut. However, if your gut is saying no, go with it! Now, after all of that, close your eyes. Imagine 10 years into the future. Do you see your big dog, with his sweet gray muzzle and calming spirit, faithfully warming your feet as you send off random pictures of him sleeping to his breeder? If not, what do you see? As Franklin Covey says, “Begin with the End in Mind.” If you can’t imagine life with your spouse 10 years from now, DO NOT tie the knot!! If you can, congratulations!! I can’t wait to see pictures of your new puppy! I am curious what you think about this list? Are there other considerations you have used when selecting a dog breeder? I would love to hear from you! Please leave me a comment and tell me how you choose a dog breeder. What has worked well? What hasn’t? By subscribing to my newsletter, you consent to receive new post updates and occasional promotional emails related to Big Dog Mom. Previous Post: « Do You Own A Big Dog Or Want To? Big Dog Mom Can Help! Communication during the process/before picking out or picking up the puppy. Is the breeder responsive and transparent? Communicates well about selection process, wellbeing of puppies, pictures and/or videos, updates. I’m having a hard time with this one, and I’m not sure if I’m just a nervous mommy-to-be! Thank you, Natalie! You have every right to be cautious and nervous, especially if your gut is telling you something that, perhaps, your mind and heart don’t want to hear. I hope that makes sense. I love your point about communication. I am someone that wants and expects over-communication from my breeder. When I don’t get it, I start to worry and question what is happening on the other end with my soon-to-be puppy. My expectations for most, even great, breeders is unrealistic though, so I try to have a little patience and grace if I don’t get updates every day or responses within a few minutes. Remember, they have lives too. 🙂 I have always said in a perfect world I would find a breeder who would just live stream every minute of every day so I wouldn’t miss a minute of my new baby’s life. Haha! I think finding a breeder who goes the extra mile is important. I was looking for a dog to be a therapy dog. I contacted several breeders and told them my intentions. I found 1 breeder who temperament tested his litter to get me a dog that had the best chances of passing the test to work as one. He also refused to fly out his pups and wanted to meet the people who were taking his pups. He offered to travel over 400 miles in order meet us. We wanted to see his kennels and meet the parents personally so we traveled over 800 miles to pick up our baby. Now 4 years later our 180lb baby brings ton of smiles to those in the facilities he visits. What a wonderful story of a truly great breeder! He was someone who not only understood what it meant and what it took to be a therapy dog, but also how critical it is to place each puppy in the right home. A breeder who sees the relationship from both sides is one I want to celebrate and thank! They are the ones who generally go the extra mile in the raising of the puppies too – exposures to new sights, people and sounds, stimulating activities, etc. I’m so happy for you and your 180 lb blessing! Thank you so much for your diligence in finding and supporting one of the great ones with your puppy purchase. I think of that 800 miles not as a price you had to pay, but as an investment in your future partner. I love it when you share! Please keep in mind that ALL images and written content on this site are property of Big Dog Mom™ and if you share my content it MUST include the link back to my blog and the post you are sharing. All printables (free or otherwise) are for personal use only and may not be sold, altered, or uploaded to another site. Please feel free to pin away: Pinning is always welcomed and very much appreciated! Subscribe to get all the latest updates and news from Big Dog Mom™ right in your inbox! By subscribing to the newsletter, you consent to receive exclusive content and new post updates from Big Dog Mom™.